Capital Structure - What is Capital Structure & Why Does it Matter? Capital Structure refers to the amount of debtMarket Value of DebtThe Market Value of Debt refers to the market price investors would be willing to buy a company's debt at, which differs from the book value on the balance sheet. A company’s debt isn't always publicly traded bonds, which have a specified market value. Companies own debt that can be classified as non-traded and/or equityEquity ValueEquity value, commonly referred to as the market value of equity or market capitalization, can be defined as the total value of the company that is attributable to shareholders. To calculate equity value follow the examples and step-by-step instruction in this straightforward guide from CFI. employed by a firm to fund its operations and finance its assets. The structure is typically expressed as a debt-to-equityFinanceCFI's Finance Articles are designed as self-study guides to learn important finance concepts online at your own pace. Browse hundreds of finance articles and guides to learn about the cost of capital, financial analysis, ratios, multiples, rates of return, profitability metics, and how to evaluate the overall or debt-to-capital ratio. 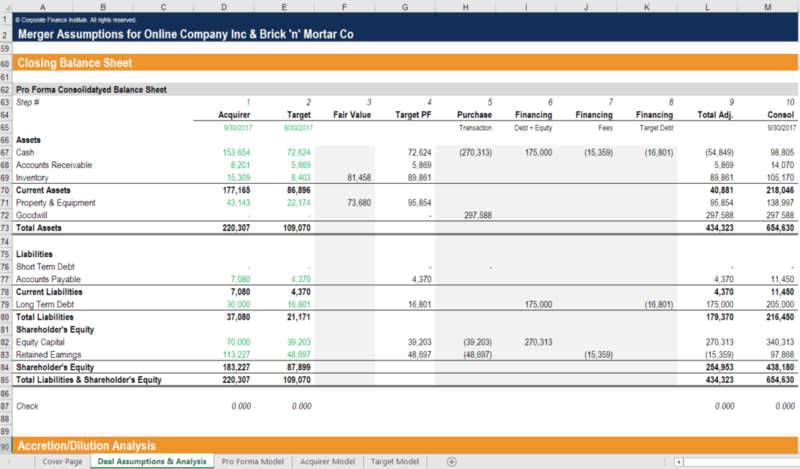 Debt and equity capital are used to fund a business’ operations, capital expendituresHow to Calculate CapEx - FormulaThis guide shows how to calculate CapEx by deriving the CapEx formula from the income statement and balance sheet for use in financial modeling and analysis. To calculate capital expenditures, use depreciation on the income statement, add current period PP&E and subtract prior period PP&E, acquisitions, and other investments. There are tradeoffs firms have to make when they decide whether to raise debt or equity and managers will balance the two try and find the optimal capital structure. Image from CFI’s Free Corporate Finance 101 Course. The optimal capital structure of a firm is often defined as the proportion of debt and equity that result in the lowest weighted average cost of capital (WACCWACCWACC is a firm’s Weighted Average Cost of Capital and represents its blended cost of capital including equity and debt. The WACC formula is = (E/V x Re) + ((D/V x Rd) x (1-T)). This guide will provide an overview of what it is, why its used, how to calculate it, and also provides a downloadable WACC calculator) for the firm. This technical definition is not always used in practice, and firms often have a strategic or philosophical view of what the structure should be. In order to optimize the structure, a firm will decide if it needs more debt or equity and can issue whichever it requires. The new capital that’s issued may be used to invest in new assets or may be used to repurchase debt/equity that’s currently outstanding as a form or recapitalization. Below is an illustration of the dynamics between debt and equity from the view of investors and the firm. Debt investors take less risk because they have the first claim on the assets of the business in the event of bankruptcyBankruptcyBankruptcy is the legal status of a human or a non-human entity (a firm or a government agency) that is unable to repay its outstanding debts to creditors. Generally, it is initiated by the debtor and imposed by a court. For this reason, they accept a lower rate of return, and thus the firm has a lower cost of capital when it issues debt compared to equity. Equity investors take more risk as they only receive the residual value after debt investors have been repaid. In exchange for this risk equity investors expect a higher rate of return and therefore the implied cost of equity is greater than that of debt. A firm’s total cost of capital is a weighted average of the cost of equity and the cost of debt, known as the weighted average cost of capital (WACC)WACCWACC is a firm’s Weighted Average Cost of Capital and represents its blended cost of capital including equity and debt. The WACC formula is = (E/V x Re) + ((D/V x Rd) x (1-T)). This guide will provide an overview of what it is, why its used, how to calculate it, and also provides a downloadable WACC calculator. To learn more, check out CFI’s business valuation course or FREE intro to corporate finance course. Capital structures can vary significantly by industry. Cyclical industries like miningMining Asset Valuation TechniquesThe main mining valuation methods in the industry include price to net asset value P/NAV, price to cash flow P/CF, total acquisition cost TAC & EV/Resources. The best way to value a mining asset or company is to build a discounted cash flow (DCF) model that takes into account a mine plan produced in a technical report are often not suitable for debt, as their cash flow profiles can be unpredictable and there is too much uncertainty about their ability to repay the debt. Other industries like banking and insurance use huge amounts of leverage and are their business models require large amounts of debt. Private companies may have a harder time using debt over equity, particularly small business which are required to have personal guarantees from their owners. A firm that decides they should optimize their capital structure by changing the mix of debt and equity has a few options to effect this change. Each of these three methods can be an effective way of recapitalizing the business. In the first approach, the firm borrows money by issuing debt and then uses all that capital to repurchase shares from its equity investors. This has the effect of increasing the amount of debt and decreasing the amount of equity on the balance sheet. In the second approach, the firm will borrow money (i.e. issue debt) and use that money to pay a one-time special dividend, which has the effect of reducing the value of equity by the value of the divided. This is another method of increasing debt and reducing equity. In the third approach, the firm moves in the opposite direction and issues equity by selling new shares, then takes the money and uses it to repay debt. 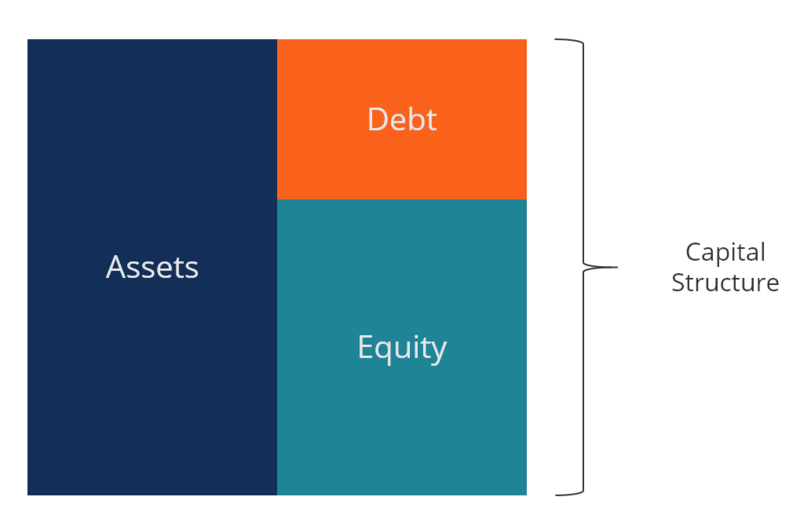 Since equity is costlier than debt, this approach is not desirable and often only done when a firm is overleveraged and desperately needs to reduce its debt. There are many tradeoffs that owners and managers of firms have to consider when determining their capital structure. Below are some of the tradeoffs that should be considered. Watch this short video to quickly understand the main concepts covered in this guide, including the definition of capital structure, what is the optimal capital structure, and the calculation of weighted average cost of capital (WACC). When firms execute mergers and acquisitionsMergers Acquisitions M&A ProcessThis guide takes you through all the steps in the M&A process. Learn how mergers and acquisitions and deals are completed. In this guide, we'll outline the acquisition process from start to finish, the various types of acquirers (strategic vs. financial buys), the importance of synergies, and transaction costs the capital structure of the combined entities can often undergo a major change. There resulting structure will depend on many factors, including the form of consideration provided to the target (cash vs shares) and whether existing debt for both companies is left in place or not. For example, if Elephant Inc decides to acquire Squirrel Co using its own shares as the form of consideration it will increase the value of equity capital on its balance sheet. If, however, Elephant Inc uses cash (which it financed with debt) to acquire Squirrel Co, it will have increased the amount of debt on its balance sheet. Determining the pro forma capital structure of the combined entity is a major part of M&A financial modeling. The screenshot below shows how two companies are combined and recapitalized to produce an entirely new balance sheet. To learn more, check out CFI’s M&A financial modeling course. In a leveraged buyout (LBO)Leveraged Buyout (LBO)A leveraged buyout (LBO) is a transaction where a business is acquired using debt as the main source of consideration. 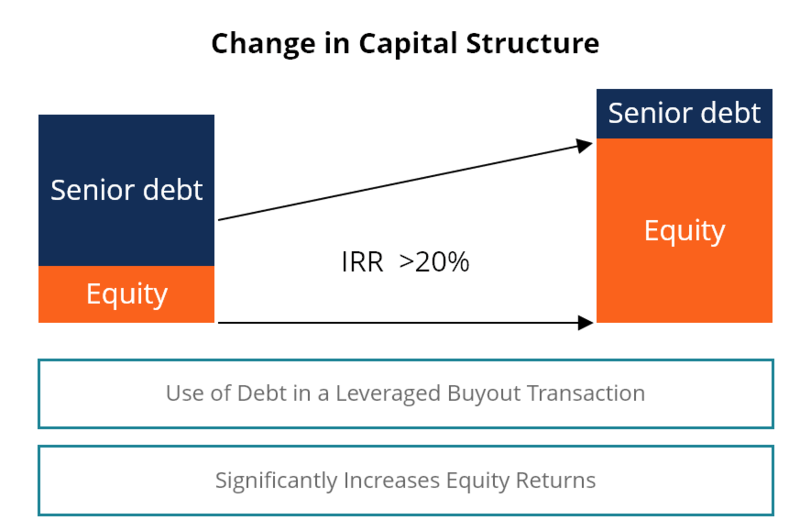 An LBO transaction typically occur when a private equity (PE) firm borrows as much as they can from a variety of lenders (up to 70-80% of the purchase price) to achieve an internal rate return IRR >20% transaction a firm will take on significant leverage to finance the acquisition. This practice is commonly performed by private equity firms seeking to invest the smallest possible amount of equity and finance the balance with borrowed funds. The image below demonstrates how the use of leverage can significantly increase equity returns as the debt is paid off over time. Learn more about LBO transactionsLBO ModelAn LBO model is built in excel to evaluate a leveraged buyout (LBO) transaction, which is the acquisition of a company that is funded using a significant amount of debt. The aim of the LBO model is to enable investors to properly assess the transaction earn the highest possible internal rate of return (IRR). and why private equity firms often use this strategy. Thank you for reading this guide and overview of capital structures and the important considerations that owners, managers, and investors have to take into account.